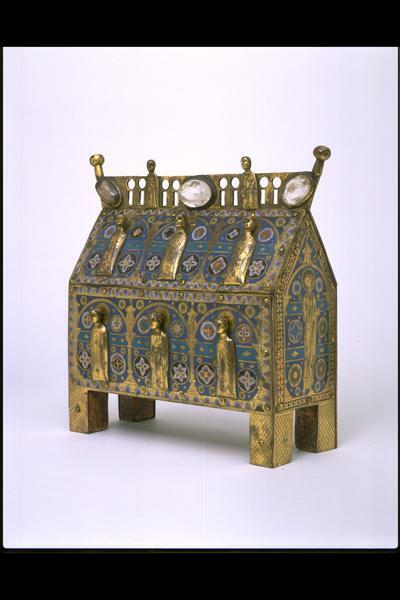 This casket uses a form popular for Limoges enamel reliquaries--a miniature stylized church, with pointed gables at either end and a steep 'roof'. Now empty, it probably once held relics - the bones or clothing fragments of a saint. 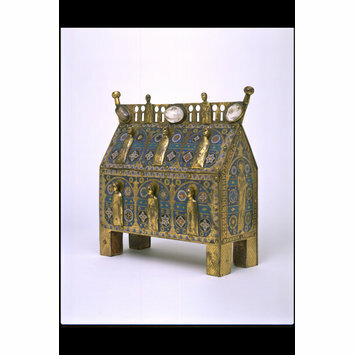 In the Middle Ages, Limoges was the centre of large-scale manufacturing of enamelled objects, particularly reliquaries (containers to hold the relics of saints), crosses, candlesticks, and wares for ecclesiastical and domestic use. Found from the Outer Hebrides to southern Italy, these enamels were widely exported; more products from Limoges survive than from any other medieval enamelling centre. Limoges enamels were made of ground glass laid into an engraved copper surface and fired at great heat. They are characterised by a range of brilliant blues and stylized multicoloured rosettes. Although their manufacture involved great skill, enamels on copper had the advantage of being relatively cheap to produce. None of the applied and engraved figures of saints on this casket can be identified, and almost identical forms can be found on other Limoges objects to which this type of figure seems to have been applied rather indiscriminately. Although certainly medieval, the two applied figures on the cresting make little iconographic sense and may have been placed there by a 19th century restorer. 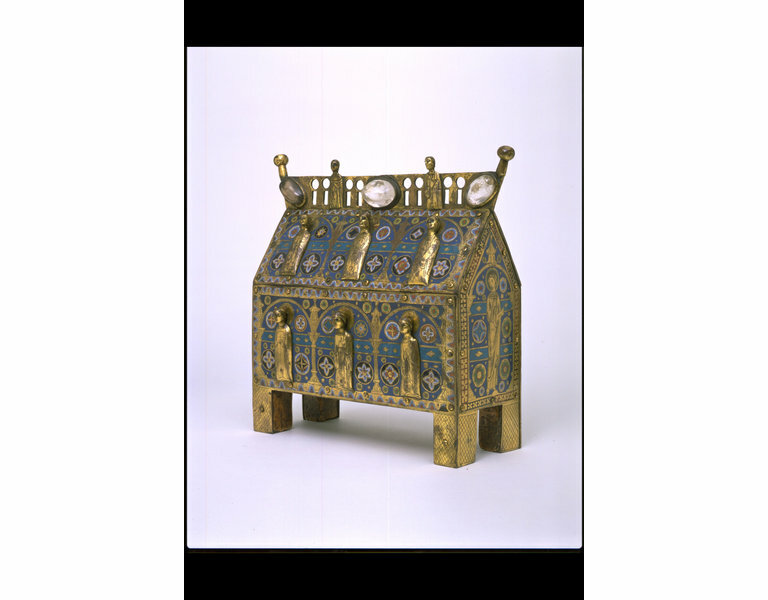 The reliquary consists of copper-gilt plaques, decorated with champlevé enamel, pinned to a wooden core. It takes the common form of a miniature simplified church building, with pointed gables at either end and a steep "roof". Engraved three-dimensional copper-gilt figures of unidentified saints have been applied to the body of the piece. There is a pierced copper-gilt cresting along the top with three glass cabochons, and two copper-gilt three-quarter length figures (possibly applied later). The two ends of the structure are decorated with plaques showing unidentified beardless male saints in reserved copper-gilt, wearing full-length robes and cloaks, with halos in enamel. Both hold books. They stand under round arches set on columns, between stylised enamel rosettes. Each has two horizontal cross-bands passing behind them. The two end plaques have an alternately black and red enamelled border, with gilded quatrefoils. The vertical front long side has three applied copper-gilt figures of saints - they are half-length, with dark glass(?) eyes, elongated hands and engraved clothing. The central and right-hand figures both hold books. The left-hand figure holds what is possibly a large communion wafer - this is held centrally with the hands covered in the robe. Each is held on with two pins. The halos are flat on the body of the casket, and are copper-gilt. The sloping upper front side has three further applied figures - again all are half-length, with dark glass(?) eyes. The two flanking figures hold books and have gilt haloes, while the central figure holds a crown centrally, with covered hands, and has a halo enamelled with a red and yellow cross on a gilt ground. Around all the figures on these two front panels are stylised enamel rosettes. Each figure is set in a rounded arch, on a blue enamel background with a turquoise horizontal cross-band. Each column between the arches and figures is surmounted by a gilt turret. The vertical back plaque is entirely enamelled, and contains two large stylised rosettes on a blue background, surrounded by smaller rosettes. There is a key hole, set sideways, towards the top. This panel is hinged along the bottom side (hinges appear original), and opens to reveal and inner cavity for relics, which is wood lined with paper. The sloping upper back plaque is also entirely enamelled, with three large rosettes using a similar colour scheme to the panel below. Both plaques have an enamelled border, alternately red and black, with gilt quatrefoils. The underside shows the wooden core, which is gessoed and painted red. The bottom side of the hinges for the back panel is visible - the right hinge is covered by the gesso/paint. There is one modern screw, and a paper label saying 2104. Bequeathed to the V&A as part of the Salting Bequest (1910). Had been bought at the Hecksher Sale (Christie's, 1898) by John Webb, possibly the son of John S. Webb, a dealer who organised the sale of many objects, particularly ivories, to the V&A, particularly during the 1860s. Although certainly medieval, the two applied figures on the cresting make little iconographic sense and may have been placed there by a restorer; also, the central crystal nearby has been reset. Both these changes predate the Hecksher sale at Christie's in 1898. After John Webb's purchase of the casket at this sale, he paid "André" of Paris £12 for unspecified restoration, which would appear (from the photograph in the Hecksher catalogue) to be the replacement of the left-hand cresting spike.